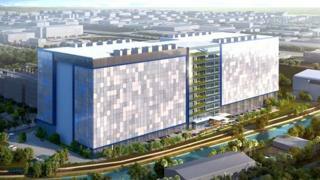 Facebook has chosen Singapore for the location of its new data centre, which is expected to open in 2022. The new facility will cost more than $1bn (£773m) and be located in the west of the country. It has been designed as an 11-floor structure, in an attempt to conserve space in the crowded nation, according to Facebook. One analyst told the BBC it was another sign of the country's popularity with large technology companies. The new, 170,000-sq-m (1.8-million-sq-ft) data centre will support "hundreds" of local jobs. Facebook said it expected the building to be powered by 100% renewable energy and noted that it would feature a liquid cooling system that minimised water and power use. "According to our testing, [the system] can reduce the amount of peak water used by 20% in climates like Singapore's," Facebook said..
Indian tech blogger Pankaj Mishra said on Twitter that the move was a "snub" to India - one of Facebook's largest user markets. However, Singapore is an ideal location for the data centre, according to Adam Simon at analyst firm Context. "Singapore is the recognised technology hub in Asia - it's where most of the technology companies have their headquarters," he told the BBC. "It's sensible because you want to be able to attract all the good talent and they've got a whole recruiting ground of technology companies based there." He added that the country also had a decades-long history of attracting technology companies to its shores, could boast good infrastructure and was ideally positioned in Asia for connections with China, Hong Kong and Australia.